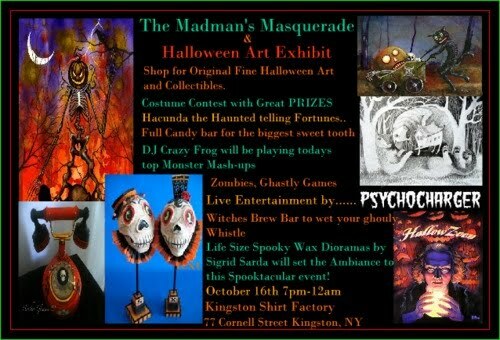 “The Madman’s Masquerade” and Halloween Art Exhibit. The Madman’s Masquerade will have plenty of entertainment such as a FULL candy “Bar” provided by Michael’s Candy Corner,Plenty of zombie candy Chic’s will be staggering about ready to entertain. Hacunda The Haunted will be telling fortunes in the Halloween Art Exhibit Room, The band Psycho Charger will play 2 live sets including their greatest ghouly hits and some off their new album “Mark Of The Psycho”. DJ crazy Frog will be spinning today’s top hits and everyones favorite Halloween tunes to dance and zombie mosh to. A Witches Brew Bar will be provided by Villa Carmella serving Bloody Reds,Ghostly Whites and some of the Madman’s top choice of beers to wet your ghouly whistle. Amazing Wax dioramas by Artist Sigrid Sarda will set the ambiance for this Hauntingly spectacular event. Be sure to wear your best Halloween costume as the Madman is having a costume contest and will be giving out great prizes! This is just a taste to what this Fangtastic evening holds. So much more marvels and mysteries to see. You will just have to stop by and experience it for yourself..